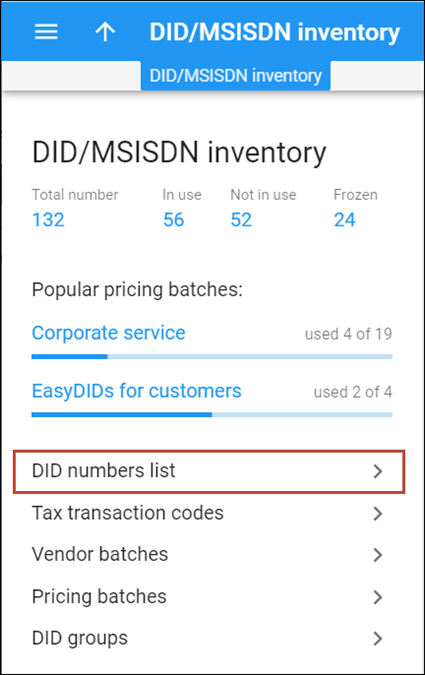 This chapter demonstrates how to efficiently manage a large number of phone numbers (DIDs) used for your SIP service. It will assist you in importing a set of DID numbers into PortaBilling®, managing them, allocating them to your customers, distributors or resellers and finally, provisioning them on SIP phones. · To charge customers the same price regardless of the type of DID provisioned to them. The steps below describe the DID provisioning model in which customers are charged the same price for all DID numbers provisioned to them. To apply different methods of charging, please refer to the How to … section. The checklist below assumes that you have already configured the basic SIP and PSTN-to-SIP services according to the instructions provided in the previous chapters. This entity is required in order to keep track of your incoming DID expenses, as well as to provide an adequate level of security on your network. If you have already created a vendor while setting up a PSTN-to-SIP service, please proceed to the next step. · Name – Type a short name for the vendor object; this will be used on the web interface (for example, DID supplier). A DID batch groups together a set of phone numbers (typically from the same city or area) provided by a particular vendor. 1. On the navigation menu, select Infrastructure, select Inventory, then select DID inventory. · Name – Type a vendor batch name. · Vendor – Choose the vendor that this batch will belong to. · Description – Your comments about this vendor batch. Now you need to fill in the DID batch with actual numbers. This is done by uploading a .csv file containing the numbers into PortaBilling®. (There is no operation for adding a single number into the batch from the web interface, as this is practically never needed; every DID supplier will be selling you numbers by the hundreds or even thousands). Name of the vendor batch this DID belongs to. Description of a particular DID number. A one-time cost paid to a vendor for the DID number activation. A monthly amount charged by a vendor for the provisioned DID number. The date that this number was released from the customer it was previously assigned to. When a DID number is assigned to a customer or a reseller from this batch, no charges apply. The country that this number belongs to. The area that this number belongs to. NOTE: The column headers are important! Make sure the field names and formatting in your upload file are correct. 2. On the navigation menu, select Infrastructure, then select Inventory and click DID inventory. · On the DID inventory page, click the Upload button on the toolbar. · In the Upload DID numbers dialog box, specify the file location (you can click the Brows button to select a file in the explorer dialog box). · When the DID number upload operation is scheduled, the notification page opens. Click the Done button to close it. · When the DID numbers are uploaded you will see a new notification in the toolbar. Click the notification icon to view it. 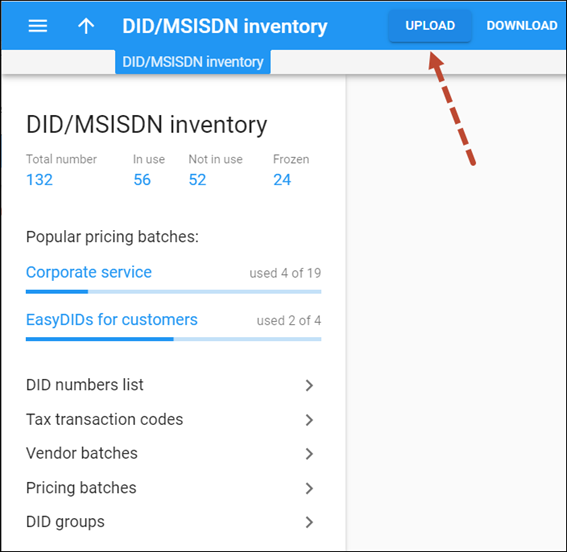 · While on the DID inventory page, go to DID numbers list to view the uploaded DID numbers. · You will see the DID numbers list displaying the numbers you have just uploaded, similar to the one below. 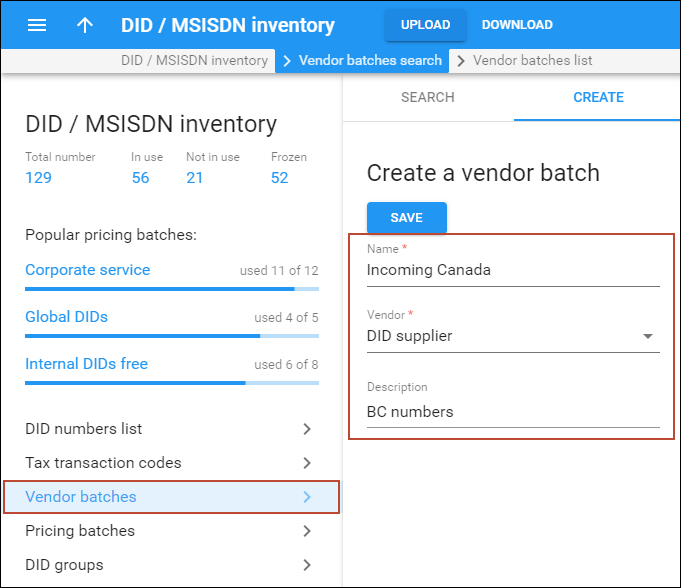 NOTE: You should create a DID batch for the vendor before uploading the DID numbers provided by this vendor into the DID Inventory. 1. On the DID inventory panel, select DID number list. 2. 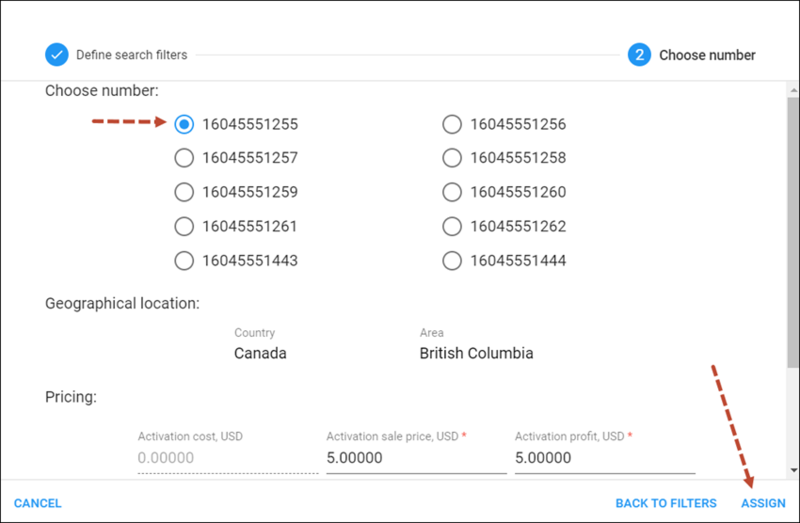 On the DID number search panel, select the specific vendor batch from the Vendor batch list and click Apply filters. 3. Select the appropriate DIDs and click Manage. 4. 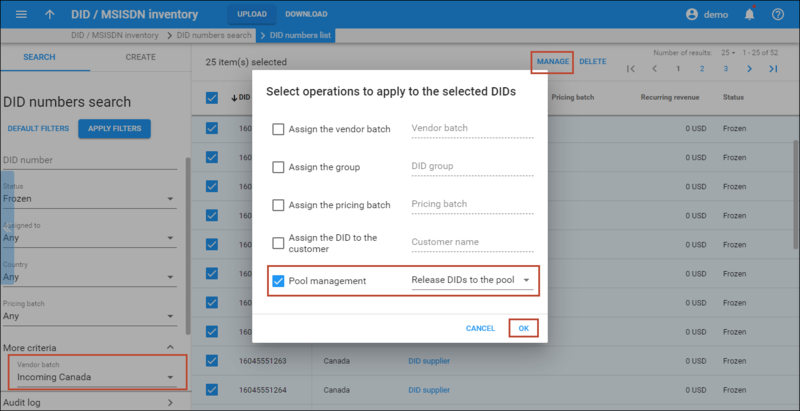 In the Select operations to apply to the selected DIDs dialog, select Pool management, then select Release DIDs to the pool. · DID numbers in free pricing batches are free of charge, i.e. no charges apply to a customer when they are provisioned with a DID number. · Pricing batches with DID markup and prices defined for them allow you to apply additional charges to your customers or resellers for provisioning and using the DID numbers. At this step it is required to create a pricing batch with a DID markup. To provision your customer with DID numbers, assign the pricing batch to them. The price defined within this pricing batch is what a customer pays when a DID number is provisioned to them. If you want to charge a different price for every DID provisioned to a customer, please refer to the How To… section. You can also create a group of accounts and allocate DID numbers to them using the Account Generator. But first you need to assign the DID numbers from the DID pool to the pricing batch. 2. 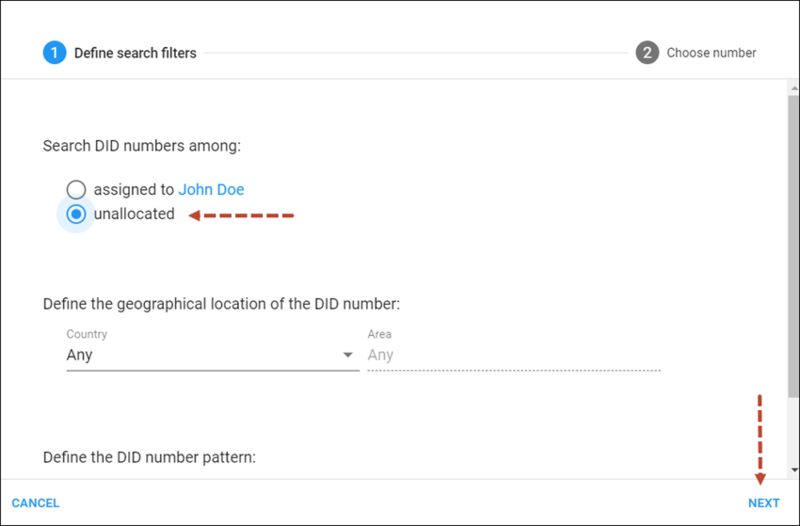 On the DID number search panel, select Not in use in the Status list and click Apply filters. 4. 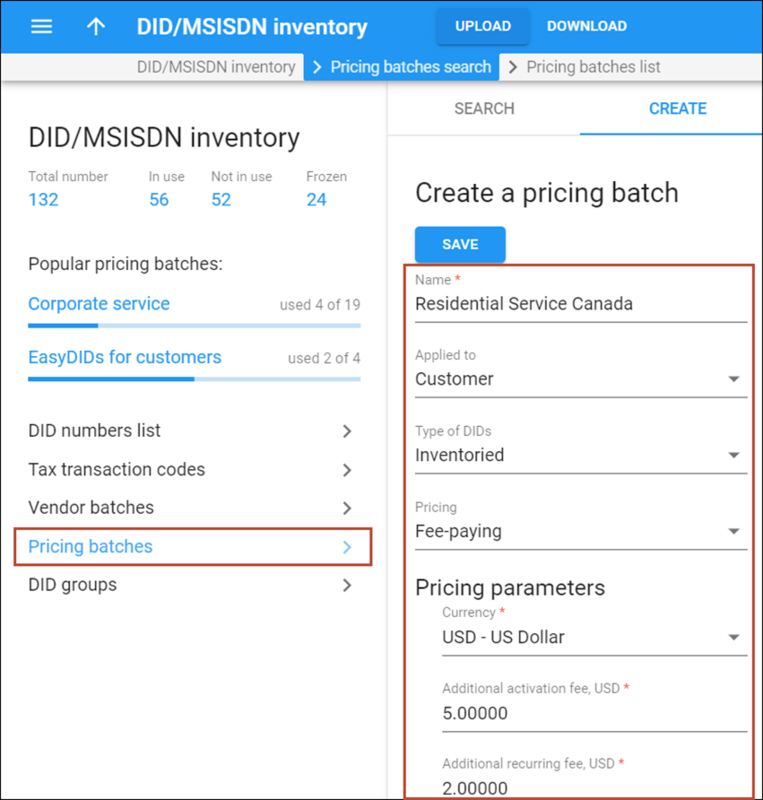 In the Select operations to apply to the selected DIDs dialog, select the Assign the pricing batch option and select the required pricing batch from the list. 5. Click Ok. On the refreshed page you will see that the DID numbers have now been assigned to the pricing batch mentioned in the previous step. Now you can create new accounts via the Account generator. 1. On the Customer panel, click Accounts. · Product – Select the product you would like the accounts to use. · Quantity – Specify the number of accounts to generate. · New batch name – You are suggested a batch name. You can define your own batch name. · Type – Select which accounts you want to generate: either credit or debit. · Pricing batch – By default, accounts with the Phone line account role are generated from the DID inventory. Select the pricing batch to take DID numbers from. NOTE: Any pricing batch can be selected for the creation of credit accounts. Debit accounts can be created only from free pricing batches. · Use DIDs from – Here you additionally define where PortaBilling® retrieves DID numbers from when generating accounts. 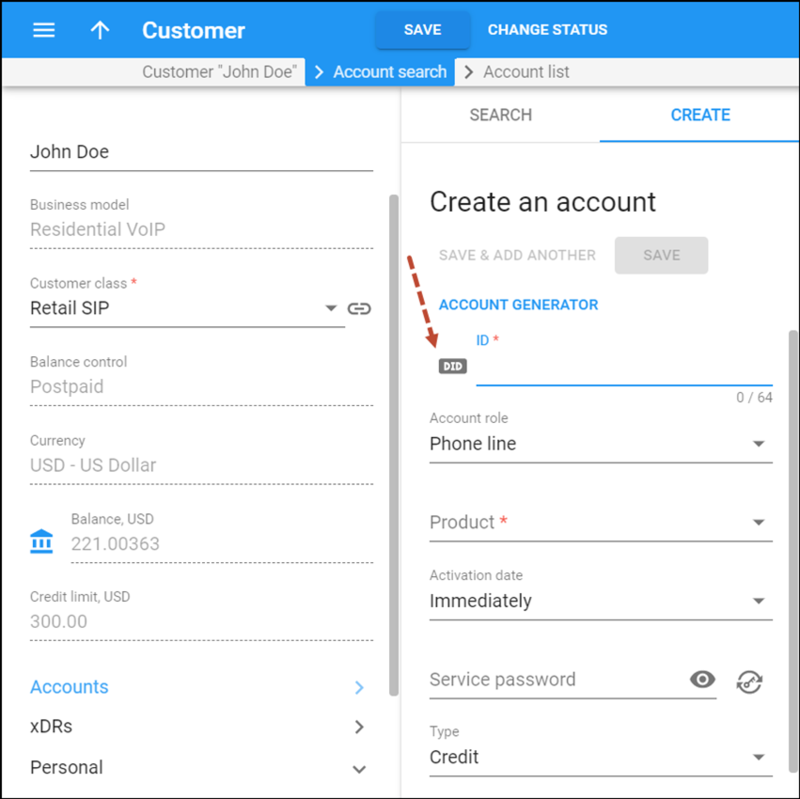 The From the DID pool option means accounts are generated with available DIDs. 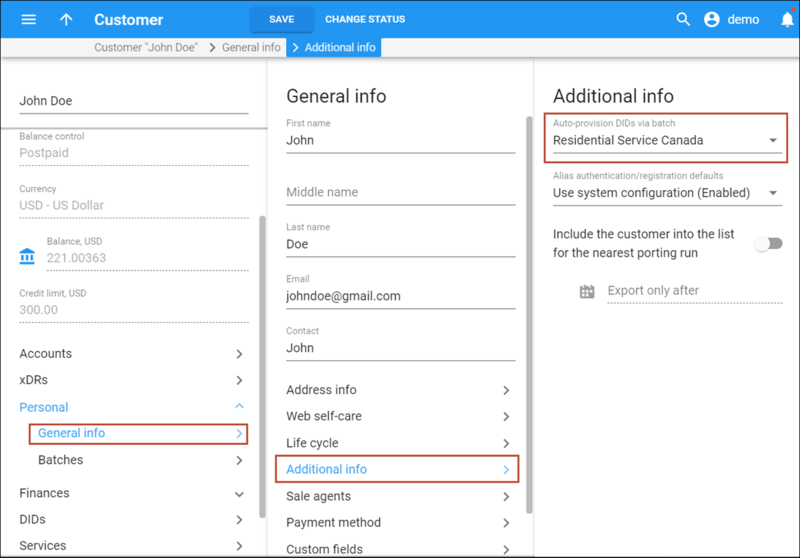 If you have reserved DIDs for the customer by assigning them to this customer, select the From the DIDs assigned to the customer option. · If you wish, you can select the starting DID from the Assign DIDs sequentially starting with menu. Use this feature e.g. if you want to make sure that the customer’s phone range starts with a “round” phone number such as 00, followed by 01, 02, etc. · Specify other account parameters according to the instructions given in the previous chapters. Here you can activate / deactivate various features of the voice calls service provided to these accounts. Verify the account generation configuration and click Generate to start the account generation process.